Farmer Patrick Certain at his downtown Billings, Montana apartment. Patrick has been searching for farmland for the last two years. He’s determined to find his own place soon and start planting this summer. Patrick Certain is one of the thousands of new farmers looking for farmland. Patrick sat in his downtown Billings, Montana apartment sipping freshly brewed coffee. Outside, cars sped down 1st avenue in the early morning light. The U.S. Labor Department found the average age of farmers and ranchers is 58. This raises concerns for the future of farming as more and more young people are moving away from the family farm and choosing careers unrelated to agriculture. As older farmers are looking to retire, this big question of “who will run the farm” can envelop every moment of the day. At the same time, as this “shortage of farmers” problem plagues established farmers and ranchers looking to retire, new farmers and ranchers just starting out cannot find land. The National Young Farmers Coalition found that access to land is the number one challenge new farmers and ranchers face. The Western Organization of Resource Councils has urged for policies that support the full diversity of farmers – beginning and socially disadvantaged farmers, Native American farmers and ranchers, farmers of color, small and mid-sized farmers, and farmers transitioning to organic or more sustainable production. During the 2018 Farm Bill, WORC advocated for government to tailer public credit and insurance in a way that keeps money out of the hands of industrial agriculture operations. Instead, WORC wants to see public money used to support people like Patrick, who want to take on the monumental task of starting up a farm and becoming a steward of the land. Patrick introduces himself as an aspiring farmer slash vintage clothing salesman. He currently works downtown at Montana Vintage Clothing during the week to save up money to eventually switch to his dream career full-time. Patrick's passion for farming and re-localizing the food system is blatant. He lights up when explaining his path to realizing his dream to farm and his plans going forward on how to get there. "The mythology that I use to explain why I ended up farming is that I'm a town kid, but I think farming skipped a generation in my family," Patrick says. Patrick's mom grew up on a large cattle ranch and wheat farm in eastern Montana near Culbertson. Patrick's grandparents are immigrants from the Basque region of France who moved to eastern Montana wanting to run a sheep farm. They quickly realized that there was more money in cattle and turned their operation into a successful ranch and grain farm. "I think a lot of my desire to farm stems from what my mom told me about how she was raised, and some of the practices she used to raise us," Patrick says. Patrick remembers his mom growing huge gardens every year when he was growing up in Miles City, Montana. But as a child, he didn't fully appreciate all the aspects of gardening and canning and feeding yourself. After graduating high school Patrick went on to study political science at the University of Montana. "Very quickly after starting school I realized I didn't want to work through the traditional halls of power — I had more fun working outside," Patrick says. "I thought to myself, I can advocate for something by doing it, rather than advocating for a million things and not really doing any one of them." After Patrick came to this realization he took a semester off and hitchhiked around the country. He ended up working on an organic farm in Arizona with some friends he met on the road. "That experience sort of sparked some of these memories of having a huge garden growing up and being close to my food," Patrick says. At the same time, Patrick was reading texts about food policy and the food system. The combination of working outside and learning organic farming paired with gaining an understanding of the entire U.S. food system propelled Patrick to get back into school to do something he cared about. 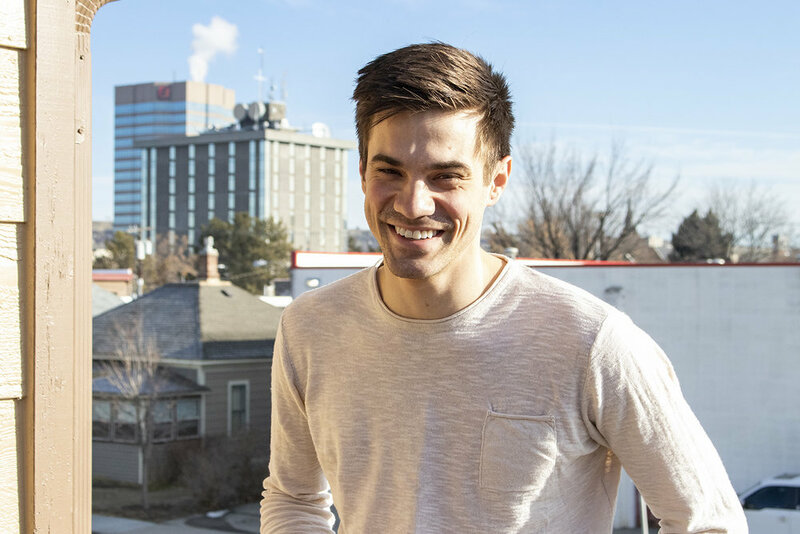 "I found the Sustainable Foods and BioEnergy Systems program in Bozeman, at Montana State University and was instantly intrigued," Patrick says. On his first day visiting the campus, an administrator to the program showed him the student run organic farm. The administrator described the farm as the “beating heart of the program.” That’s when Patrick knew farming was what we had been searching for. "It is so satisfying to work outside and see the very tangible effects of your labor coupled with all of the philosophical reasons for re-localizing food and making local, organic food the norm," Patrick says. Eight years after deciding he wanted to farm, Patrick is still as dedicated as ever to making his dream happen. "For the past eight years I've been working on different farms learning as much as I can," Patrick says. Patrick grew vegetables on a farm down in Bridger; he grew flowers on a flower farm in Bozeman; he worked on an aquaponic farm in Hawaii; he worked on an organic grain farm up in Big Sandy Montana; and he grew microgreens in Billings. "I've tried my hand at a bunch of different farming and I've searched to find where my place is," Patrick says. Today’s climate for that food source is ripe in Billings. “I think there's a real renaissance going on in the micro-scale farming world both in combining old and new techniques to make farming a viable option for someone who doesn't have a ton of money to invest in big, expensive equipment," Patrick says. A few decades ago, prior to local food movements, young people getting into farming had to get into even more debt than today to purchase big equipment to farm large scale. Today, however, this "get big or get out" model of farming isn't the only option anymore. New farmers are more able to plan out realistic farming models and methods that are smaller, easier to run and more localized. Despite this, the fact remains that new farmers are still struggling to purchase land. Patrick has been searching for the right land for the last two years. He has utilized databases like “FarmLink,” which helps new farmers connect with farmers looking to retire, but hasn’t found a good fit for what he wants to do – localized organic vegetable farming. "Where I'm at now is, I'm going to take out a pretty modest loan for infrastructure and I'm looking for land to lease," Patrick says. Patrick was hopeful that he would one day be able to farm the land his grandfather originally purchased, but like most family farms it’s a complex relationship of who should get the land. "The family’s farm, like most family farms, is kind of the classic American farm story,” Patrick explains, "my mom has six siblings, and when my grandpa passed away, my mom's brother ended up running the farm while he was in law school...so naturally he became the proprietor of it." A few years ago, when Patrick was finishing up school in Bozeman, he and some friends had an idea to start a “from seed to bottle” brewing operation on the family’s land. “I pitched the idea to my uncle, who is incharge of the farm, but he wasn't interested because so much of that land is in conservation reserve program and in-actively managed," Patrick explains. Today, Patrick’s family’s farm is managed by an uncle by marriage. The outbuildings and homes on the land are falling apart and drowning in weeds. Although it’s sad to see the farm in that condition today, the full story of the farm is a happy one. It embodies the American dream. The farm provided for six kids who eventually went on to become doctors and lawyers. “I think the story of the family farm is a hopeful story … I don't think the story ends with the deterioration of the family farm, because the farm served its purpose and then some,” Patrick says. Patrick's aunts and uncles sometimes question his drive to be a farmer, but Patrick knows what farming stands for. "I say different things at different times, but I tell my aunts and uncles, ‘Grandpa would be proud that one of his grandkids ended up doing what he did.’"
Patrick's grandpa, Bert, was a cutting edge farmer in his time. Bert won several awards from Natural Resource Conservation Service and the Department of Agriculture for conservation and tillage. Patrick wants to build on that legacy. When Patrick isn’t working downtown, he spends his time drafting out farming plans and talking all things food and farming. He is hopeful that he’ll find land in the next few months, and is determined to have his first crop of garlic in the ground come September.